Wind turbines convert the energy of the wind into mechanical power. In wind turbine generators, this mechanical energy is converted into electricity, which for larger units is fed directly to the grid. Wind turbines are usually grouped into wind farms that share common infrastructure such as a common connection to the electricity grid. The central issue surrounding wind power is supply reliability. While the turbines themselves are proven and reliable, wind itself fluctuates so it cannot be relied upon as a base load power source. However, in the proper locations, wind can be an excellent source of cost effective generation into the grid. Improving the cost effectiveness, efficiency, reliability and durability of wind turbines. Provide safe working conditions for employees and contractors. We worked with the proponent to establish the foundation of a business case and the material to be used in approaching potential investors. Our focus was on the uncertainty involved in such a business. Table 1 shows some of the main questions that were addressed. Why have these sites been chosen? How do we know this is the best value option? What will be the operating capacity of the wind farm (in MW)? When do the turbines operate; how much electricity is generated; is there a minimum required before transfer to the grid; how is the grid monitored and controlled; is there a need to store surplus power generated; what is the operating capacity of the turbines; at what level do they operate (% of capacity)? Can we sell the power we generate? At an early stage of our involvement, we conducted an initial qualitative risk assessment. We developed initial lists of things that might be important from documents and web sites using a range of sources available at that time, including the Australian CSIRO, the Danish Wind Industry Association, the annual reports of IEA Wind and others. We grouped them in categories (Table 2), and used them as a starting point for more extensive brainstorming. A selection of the high risks that we identified is shown in Table 3. The risk register that was generated formed just one of the inputs to the quantitative analysis of uncertainty that followed. Because all these sources of uncertainty would be of interest to potential investors, the modelling was used to highlight areas that would need clarification before the consortium approached the market for financing. These were valuable for guiding the early activity of the development team. The cash flow uncertainty model was used to optimise the design and project implementation. The aim was to ensure, as far as possible, that the risk associated with the financial targets for the business was limited and the measures required to control that risk were well understood and implemented properly. Planning and forecasting covered all aspects of each wind farm, including securing sites and connection agreements, power purchase agreements (PPAs), procurement, contract and site management and overall project management. The estimates of schedule were continually refined and analysed to identify and accelerate critical path activities. The aim was to minimise the time taken between project start up and commencement of power generation at the first site to be developed. The financial model could be tailored to generate the key parameters required by either equity investors or debt providers. It was capable of producing sensitivity analyses on key variables such as wind resource, capital and operating costs, gearing, debt term and rates of return. Values derived from the primary items that were used to evaluate the business more broadly (Table 5). Values for the main model components, and the assumptions underlying them, were documented carefully, so the model and its outcomes could be explained to potential investors. Table 6 shows examples of extracts from estimating worksheets. While these examples are very generic for reasons of commercial sensitivity, parts of the model contained significant technical and operational detail, quantitative estimates and ranges of uncertainty. 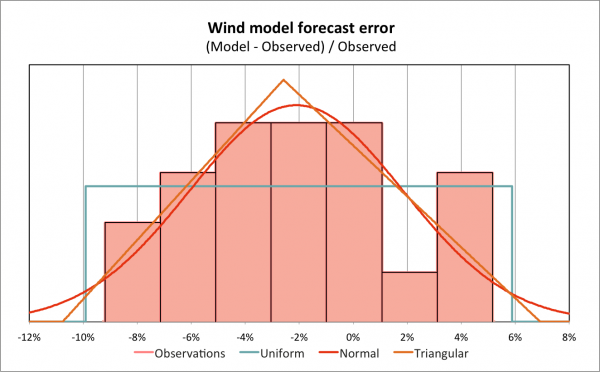 Wind models can be remarkably accurate in terms of the range of deviations from observations. Although Figure 1 is based on mean annual wind speeds, other wind characteristics like wind direction, annual power output and wind speed through time are also predicted well. Such wind models are a valuable aid in wind prospecting, selecting potential sites for wind farms. In the early stages of developing a wind farm, empirical data are unlikely to be available so forecasts from wind models must be used. The uncertainty in wind energy at a site, as represented by the divergence between model forecasts and observations, is large enough to be included in a quantitative risk analysis, in the absence of extended on-site observations. The uniform, normal and triangular distributions shown are all plausible and demonstrate similar goodness-of-fit to observations. Empirical data from observations on the proposed site of a wind farm are strongly recommended. The time taken to collect sufficient wind data to provide confidence and support for commercial decisions must be included in project schedules and hence in cash flow models. Developing and documenting a business case can be an extensive, time-consuming and expensive process. While aspects of an ‘internal’ business case can be assumed as known – related to matters of corporate policy and risk appetite for example – more rigorous and transparent exposition is required for external finance providers and their clients. In addition, simple economic models of cash flows that show net present values and rates of return must be extended to show a wider, enterprise view of the business that is proposed and its after-tax implications. Realistic modelling of uncertainty is required in either case, but model outputs may need to be explained in a different way for a wider audience that might be less familiar with the concepts of probability and distributions. Coppin, PA, Ayotte, KW, and Steggel, N (2003) Wind resource assessment in Australia – a planners guide. CSIRO Wind Energy Research Unit. CSIRO Wind Energy Research Unit. IEA Wind, the International Energy Agency (IEA) Implementing Agreement for Co-operation in the Research, Development, and Deployment of Wind Energy Systems. Steggel, N, Ayotte, KW, Davy, RJ, and Coppin, PA (2002). Wind prospecting with WindScape. CSIRO Wind Energy Research Unit. 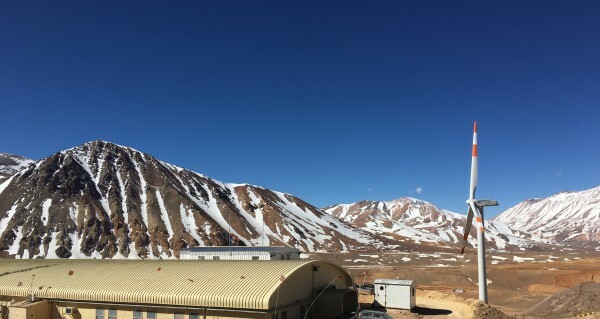 Windlab, a global wind energy development company established to commercialise world leading atmospheric modelling and wind energy assessment technology developed by Australia’s premier scientific research institute, the CSIRO. To download a copy of this case, please click here.